Due out this December from Days of Wonder is the third volume in the Ticket To Ride Map Collection Series. The Heart of Africa brings a new twist to the Ticket To Ride series. In addition to the African map, this expansion introduces 45 new Terrain Cards divided into three different types: ◘ Desert & Savannah, ◘ Jungle & Forrest, ◘ Mountains & Cliff. Each terrain type is associated with different route colors. Drawn just like Train Cards, when played timely they can help the players double the value of the routes they claim. 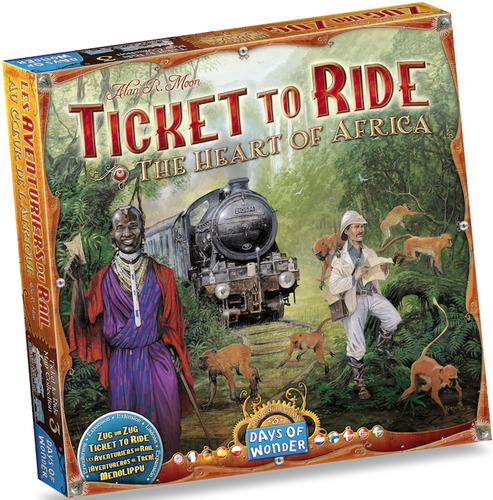 A reminder that Ticket To Ride - The Heart of Africa is an expansion and will require the Trains and Train Cards from the base games Ticket To Ride or Ticket To Ride Europe. Continue to Tune In to us for the latest in board game news.